When we found out I was pregnant, one of the first things I started researching were my car seat and stroller options. There are so many options out there including various colour combinations (not the most important point but come on, you know you take it into consideration), travel systems, three wheels vs. four wheels, accessories included or not (a lot of times things like cup holders, trays, etc. are all extra add-ons which can add up pretty quickly so keep this in mind), infant vs. other car seats, etc. etc. etc. The list of options goes on and on so it's no wonder it is an extremely daunting task for new parents. 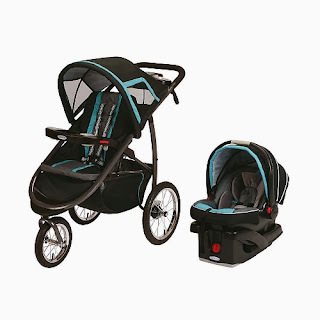 I knew we wanted a travel system (I was already overwhelmed with the prospect of having to properly install a car seat into our truck, so I wanted to make sure I made the system as easy as possible for me from the get go) and we wanted a jogging stroller (husband request). 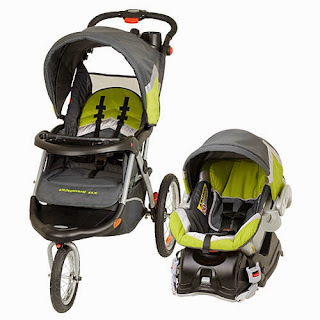 After a LOT of online research a trip to Babies R Us, the travel system I really wanted was the Graco - FastAction Fold Jogger Travel System with SnugRide Click Connect 35 Infant Car Seat - Tidal Wave. Only issue is that it was on back order and no one could tell me when it would be available again. I started to see if I could buy the stroller (in the States) and car seat separately (you must buy a car seat in Canada - you can't use U.S. car seats here) but I couldn't find the matching pieces for a reasonable price and the car seat alone was on back order. So - back to my research because this was not something I was going to leave to the last minute - especially the car seat. My friend had told me about this travel system that she had and loved for her little guy: Baby Trend Expedition ELX Travel System Everglade. When another friend told me it was on sale for a limited time at Babies R Us, I quickly ordered one and our travel system was chosen. - The colour matches the diaper bag I had already purchased. Yes, this is not an important point at all but I'm just being honest. - It's very easy to open and close the stroller. One button? Yes please! - It comes with all the accessories so you don't have to buy any extras. - It's a jogging stroller. - It was very reasonably priced. - It's heavy. Both the stroller and car seat alone are heavy so once you add a baby on top of it all, momma is getting a workout! - The car seat is for up to 22 pounds whereas the original one I wanted goes up to 35 pounds. Not a huge deal but it would be nice to not have to buy another car seat so soon. - The buttons that are used to raise and lower the car seat handle seem to get stuck. Not sure if this is a design flaw or just our particular seat but it is frustrating. It always goes up and down eventually, just takes some jiggling to get the job done. - The front wheel (when not in locked mode) is quite wiggly. Feels loose. A friend said I could tighten it so I will give that a try (aka - tell my husband to do it). So would I recommend the Baby Trend Expedition Travel System to a fellow new parent? Absolutely. I have read a lot of comments on line basically saying that it is just okay but honestly, if budget is a factor (which it is for most people I hang out with) then this is a good option. I must admit I don't have anything physically to compare it to myself but I am definitely happy with this purchase so far. Are you a 1st Time Mom and trying to figure it out as you go along too? Feel free to leave me a comment with any questions and I will be more than happy to get back to you. Thanks for reading!